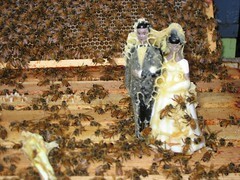 My bee sculpture looks like it’s going to be a success. 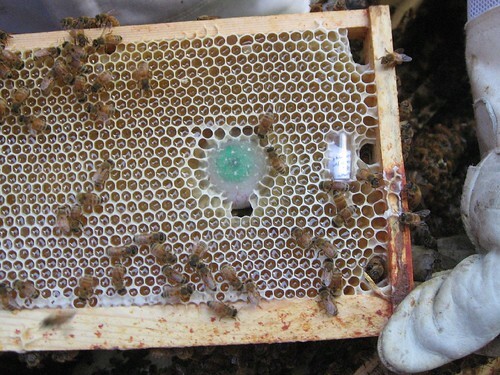 You may remember that I tried coating some objects in a light film of beeswax, then placed them into the bee hive to see if the bees would wrap their comb around the objects. I went in over the weekend to check the progress and it looks like they’ve been very, very busy. 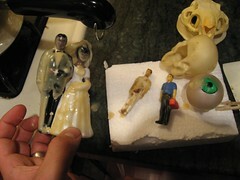 As I’d hoped, they completely entombed the bride and groom figurine, the eyeball, the plumber and the message in a bottle in comb. Unfortunately, because of where I put the objects, it’s really hard to take pictures of. Trust me, it’s beautiful. I’ve decided to wait a few weeks until the honey in the comb around the objects is capped, to avoid honey dripping out all over the place when I remove the objects and comb and mount them for display. Here are a few pictures in the meantime. 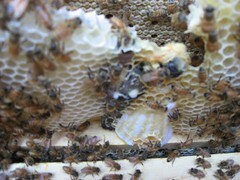 The first two pictures are the “before” pictures (i.e., before I put them in the hive at all and after one week) and the others are from this weekend. Cool, neh?